Quality Control is at the core of all that we do. Our clients rely upon us for the timely, accurate information necessary for crucial decisions which impact project schedules. 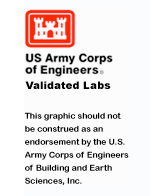 As a result, we maintain an aggressive internal quality control program, including validation and certification of our labs by the U.S. Army Corps of Engineers, AASHTO and state departments of transportation. We are accredited for evaluation of hot mix asphalt, concrete, soils and aggregates. Building & Earth Sciences’ professional engineers are registered in 35 states and our CMT field and laboratory technicians possess current NICET, AWS, ACI, ICC and/or DOT certifications. Our dedication to the training of our associates maximizes their effectiveness in the field and ensures that our team is ready to deliver results from the first day we set foot on site.